I'll never forget the first time I met Sheldon Vanauken at his home (Vancot) in Lynchburg, Virginia. One of the first questions I asked him, after we sat down and he had served me a drink, was: "Do you have any photographs from your time in Oxford?" He said, "No, I had given up photography by that time. But if you reach around and pull that book off the shelf behind you, then you will find some interesting photos there." 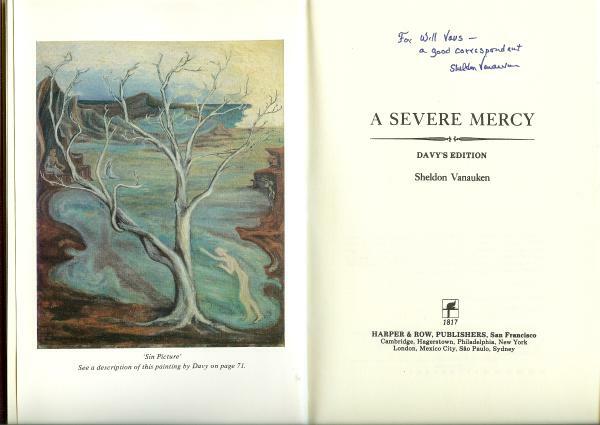 The book was A Severe Mercy: Davy's Edition. I received my own copy of Davy's Edition on my next birthday and Van very graciously signed it for me. Years later I continue to enjoy the 8 or 9 photo pages almost as much as the text of the book.